Poole nailed this shot to give Michigan the win, following a remarkable pass. 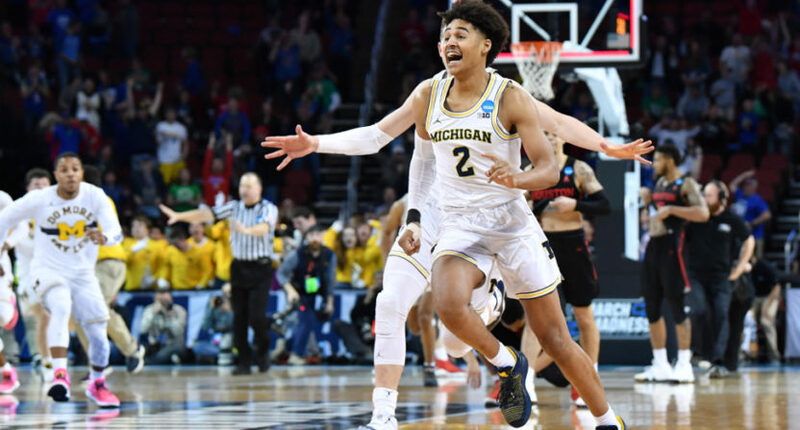 Things looked pretty dire for the third-seeded Michigan Wolverines in the final seconds of their second-round NCAA Tournament game against the sixth-seeded Houston Cougars Saturday night. Michigan trailed 63-61 in the final minute, and that could have been even a wider lead if the Cougars had hit some foul shots. But even without that, the Wolverines were still down by two points with 3.6 seconds left, and they had the ball under their own basket with no timeouts. Inbounder Isaiah Livers threw a long one-handed pass to Muhammad-Ali Abdur-Rahkman near the halfcourt line, though, and Abdur-Rahkman dribbled towards two defenders before hitting open freshman guard Jordan Poole. Poole got a three up with just 0.8 seconds left, taking some contact from the defender who tried to close him out in the process, and his shot dropped for the 64-63 win. Freshman Jordan Poole hits the three at the buzzer to send @umichbball back to the Sweet 16! That’s an amazing finish, made perhaps even more impressive by a freshman like Poole (who averaged just 13.1 minutes for Michigan this year and just 6.4 points per game) being the one to hit that shot. And it also made for a couple of terrific calls.